On March 18, thousands of citizens and members of social movements and political organizations flooded the streets of Colombia in defense of the Special Jurisdiction for Peace (JEP) and in support of peace in Colombia. The mobilizations were called for by the opposition block in the Colombian Congress as well as diverse social movements, human rights organizations. On social media, the hash tag #HoyMarchoPorLaPaz [#TodayIMarchForPeace] trended urging people to join the mobilizations. In Bogotá, over 10,000 people gathered at the Plaza de Bolivar to reject the objections raised by the Colombian president Iván Duque to 6 of the 159 articles of the statutory law of the JEP. The cities of Medellin, Bucaramanga, Barranquilla, Cali and Cartagena also saw huge mobilizations. The demonstrators shouted slogans such as ‘la guerra nunca más, sí a la paz’ [‘war never again, yes to peace’] and marched with banners and placards that read: ‘We defend the JEP’, ‘Ratify JEP for Peace’, ‘Peace is not to be objected’, ‘No to war, we defend life’, ‘Peace is necessary, the JEP is special, we embrace the JEP’, etc. At the Plaza de Bolívar, a “Pact for peace” was promoted which seeks to urge the Congress to fulfill the constitutional mandate of peace, reject presidential objections and consequently, approve the statutory law of the JEP. Today, March 20, the Constitutional Court will issue a decision today to determine whether or not the President’s objections are acceptable and if they say that they are, the Congress will vote on whether to reject or accept his objections. 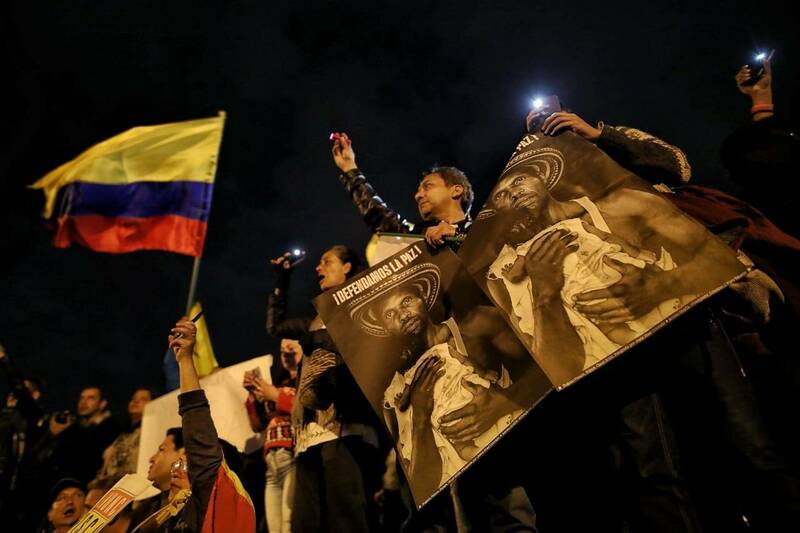 Rallies in support of the JEP and peace in Colombia were also carried out on an international level. In Argentina, UK, the Spanish State, France, and the US, Colombian communities and activists reiterated their support of the peace agreements and the necessity to protect the JEP and also expressed their solidarity to the peasants and Indigenous people currently mobilizing as part of the Minga in the South West of Colombia. The JEP is a transitional justice system established through the peace agreements that were signed between the former Revolutionary Armed Forces of Colombia (FARC) and the Colombian government under former president Juan Manuel Santos, in November 2016 in Havana, Cuba. It establishes a court which would investigate, judge and sentence all those considered responsible for the crimes committed during a five-decade war between the guerilla forces and the Colombian security forces. “Despite the smear campaign led by the political sectors that have repeatedly attacked and opposed the end of the armed conflict, it is our duty to protect the Special Jurisdiction for Peace – JEP, a fundamental part of the construction and preservation of collective memories, of the truth about what happened in the armed conflict, of those responsible, and above all, of the No Repetition guarantee of the victimizing facts. Attacking the JEP is attacking the victims,” read the statement signed by the diverse organizations, entities and individuals who defend the peace agreements.